This was a blog-filled weekend for me. Not MY blog, mind you, but others'. See, Mr. ODJ had a bunch of social engagements over the last week or so, meaning that I was putting in a little extra evening bedtime work in while he was out - he's in charge of bath and stories most nights, usually while I'm trying to scrounge us something resembling dinner out of the pantry/freezer. What that meant for ME (aside from some extra quality time with His Cuteness this week) was that I got to negotiate a little non-baby time for myself here on a nice chilly Sunday afternoon, time I could spend however I chose. Normally, I would choose to a) sleep; b) finish up one of the eleventy-million projects littering the house; c) make some underpants clean for the Mr and I for the upcoming week; d) drink heavily; or e) make some calls/write some emails to catch up with the friends and family that I can never seem to find the time to keep up with anymore. Not necessarily in that order. Oh, um....right...also maybe write some damned thank you notes already. Ahem. Oh, and did I mention sleep? Instead, as a measure of the mature and responsible Adult (and also Parent) that I am, I chose to spend this fine and glorious Sunday catching up on the Bloglines backlog, a backlog of posts numbering in, I kid you not, the THOUSANDS. I will admit it. I briefly considered marking all of them as 'Read', and just starting with a clean slate. See above...THOUSANDS. Y'all are a chatty lot, and I mean that in the best possible way. I thought about it, and then realized that I couldn't. I too badly wanted to know how everyone had spent their summer. So I read, and read, and read. And then I read some more. Then I made us some clean things for the upcoming week because really? Clean underware. I'm just saying. There was little to no commenting, I knew there was no way I could afford that luxury and still make it through. No commenting, just lots and lots of reading. And I almost made it, I did. About 2/3 of the way through, some thing fantastically screwy happened to the laptop. I have no idea what, as I was not in the room - or on the same floor even - when it happened, but when I came back with my hot chocolate, the computer was frozen, Explorer was closed, and my Bloglines slate had been wiped completely clean. Completely.Clean. Insert your preferred string of obscenities here. I did. No, the Mr. wasn't in the room either, and shame on you for thinking that. So I went and played in Ravelry for the first time in months. Lemons to Lemonade, says me. Knitted over Thanksgiving weekend during the 4-hour drive to St Albans, VT to visit family (and back). There is just so much joy in the instant gratification factor of a beautiful, giant yarn on giant needles. Yarn: Decadent Fibers Cream Puff in (I believe) the 'Indian Corn' colorway. This yarn salvaged from a failed sweater idea. 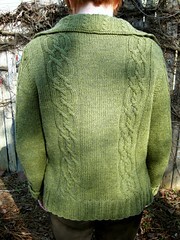 Mods: While mine is a bit longer than the one in the pattern, because I have a longer coat, the only modification I made was to add a few short rows to the center ribbed section at the top. I wanted it to stick up a little higher than the rest of the piece and sort of make a little half-hood. It works perfectly, and just flips down like a little shawl collar whe not in use. Also, despite the lopsidedness going on at the top of the Seaweed (the left of the picture), it IS actually a normal arc, not all wonky like that. Hat: No pattern. Just started knitting and decreased as necessary to make it the shape I wanted, trying it on a couple of times in the process. Knit flat and seamed up the back because a) I didn't take any DPN's with me since I wasn't planning on knitting a matching hat (er...do I even own #13 DPN's?) and b) I really wanted it to stand up and not be floppy so I thought a seam would help, structurally. Neck Warmer: Betcha didn't realize that's what that freaky thing at the bottom was, eh? Wearing this seaweed thing over a carried baby - a GRABBY baby, I might add - when one's primary base garment is a nursing tank with some sort of cardigan-ish top over it leaves a LOT of flesh exposed to the elements. None of my scarves survived 5 minutes hanging right there in front of B's curious little eyes, hands and mouth, so I had to come up with something different. I just cast on enough stitches to cover the exposed neckline of my favorite nursing tank, knit for a bit, started decreasing to a size that would wrap aroud my neck, yet lay flat. I did 3 or 4 shortrows to get the bump for the back of the neck (nothing worse than the wind whistling down the backof one's collar) and then straight on to the end of the piece. Add one button and voila. Neck warmer. I knew the thick and thin nature of the yarn would give it that little scalloped edge, so I didn't even have to dress it up any. I'm not going to bother to promise pictures of this ON since it gets dark here just sortly after luchtime, for pity's sake, but I'd like to think we could make that happen. We'll see. And now, since it is a couple of HOURS past my bedtime, I'm off. If anyone wanted to send B some sleepy vibes so that he doesn't wake me until morning, that would be grand. 1 - Papa Bear learned how to change a diaper. Hooray! 2 - Apparently, that hair dryer I haven't touched in almost a decade (but for some reason have been unable to convince myself to dispose of) might actually be able to pull it's weight now in that it can be used, apparently, to calm a fussy baby. 3 - There ARE actually women out there who are MORE pregnant than me. I had begun to doubt that fact, but it's true. Also? 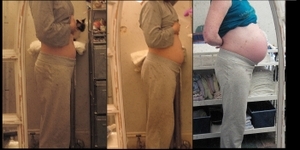 That there really IS a huge difference between a 28-week belly and a 36-week belly. Huge. Difference. 4 - Disappointingly, depite thousands of years of civilization and our ability to put men on the moon and rovers on mars, there is still only one reliable way to get a newborn baby's temperature. And yes, it still involves vaseline, if you get my drift. Sure, later there are other options, but not for the newborn. 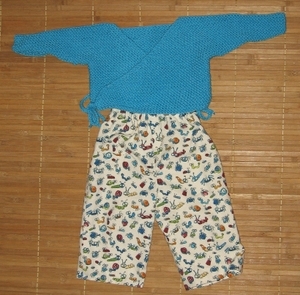 Baby Kimono from Mason Dixon Knitting in Cotton Ease (old skool) 'Popsicle' ** (see? 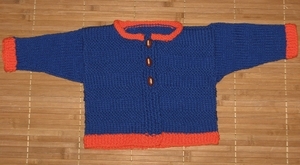 I do still knit.) and Buggy pants sewn by moi. Baby pants, it turns out, are addictively easy, so expect to see more of this sort of sewing project on here. I have a fabric stash that - while nowhere near as aggressive as the fiber/yarn stash - has the potential to scare the uninitiated. Next we learn how to install snaps on these puppies for easy diapering access. This is 14 wks vs. 20 weeks vs. 32 weeks, that last being four weeks ago. 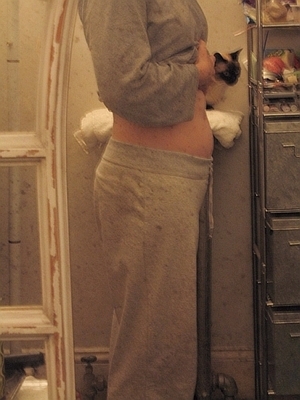 Maybe I can enlist some help this weekend to get some 36 week belly shots in slightly more interesting settings. Like....say.....MA S&W out in Cummington? 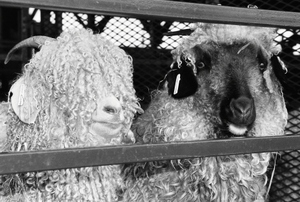 Belly + sheep = giggles. Who's going? C'mon, fess up. Inquiring minds want to know. **OK, and can we just take a moment or two to contemplate all the reasons that this outfit in this yarn is impractical and inadvisable for most human beings? Seriously. Think about it. Now that the Great (and fabulously fun) Swatch Project '07 is a week behind me, there's been time to finish a few baby items started over the last few weeks. Nothing huge, just some fun, fast, useful stuff. At least, I HOPE they're useful. 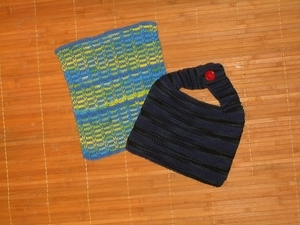 Bib and burp cloth from Mason-Dixon Knitting. The bib is 'Black Watch' Lion Kitchen Cotton, and the burp cloth is two colors of Sugar and Cream. I'm a little shocked at this current cotton addiction because cotton and me? Not.Friends. That said, maybe it's because there's no purling, or maybe it's because the projects are small, I dunno, but I'm loving the lack of 'cotton hurties' because these are seriously adorable things to knit. Hell, I'm already well on the way to finishing another bib, not shown here, in...you guessed it, orange and blue. I know. Poor kid. A wee hat from One Skein Wonders, using one stashbusting skein of 'Vacation' in Denims from Knitpicks - from one of my very first 'test' orders from them. Seriously, you just can't get any better than one skein, one hook (yes...it's true, it's CROCHET), one loop, one evening, one hat. I'd have like to have said one hour, which is just about how long I think it would actually take, but I was on the phone at the beginning of the project and kept screwing up even the simplest of instructions. Note to self: Multi-tasking is off-limits for the next 100 days. One very UNamused cat, and the Anchor Booties from 50 Baby Bootees to Knit. The cuteness is killing me. I need to do a skull and crossbones pair FAST to help dissipate the cloying sweetness. Right after I get those Bee Shoes done. 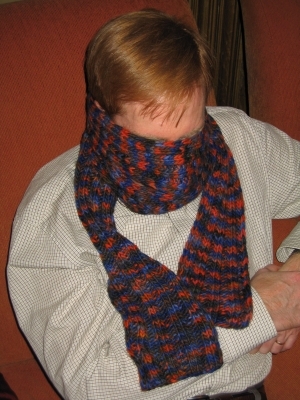 Simple 2 x 2 rib scarf using one skein of Malabrigio and size 9 needles. So soft. So yummy. Nice and long for the winter wrapping. What? 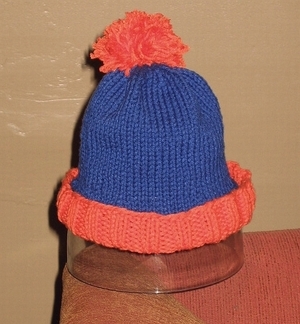 You want MORE Gator Nation knitting? OK, you asked for it. Apparently all of Rick's college buddies are determined to get started making thier own football team because we now have had 3 baby gators this year, and there are 4 more 'in the works' as I type. Anybody know of a good pattern for an alligator stuffed animal? 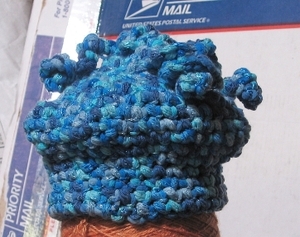 I suspect knitting these hats is going to start to wear thin pretty soon with so many to do. I seem also to still be falling behind faster than I can keep up, but that's a slightly different topic. I know, shall distract you with photos.....of finished objects even. 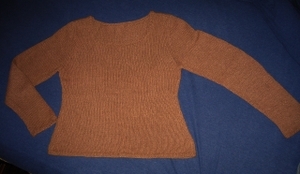 Pattern: Princess sweater from Classic Elite's First Edition - it's the solid orange one in three of the photos and on the cover. Yarn: Knit One Crochet Two's Angora Soft from Webs in color 'Milk Chocolate' - 8 balls. 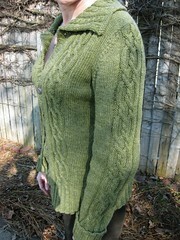 -- This is the perfect simple sweater for me. Perfect. -- Why? The pattern is simple; the shaping is simple and easily adjusted with a minimum of math; the neckline is lovely and open, casual enough to wear with jeans without being in any way inappropriate for work (and also very, very easily changed). It's also got the perfect simple edging that lays flat w/o much coaxing, and this is all in a pattern that is two measly paragraphs long. 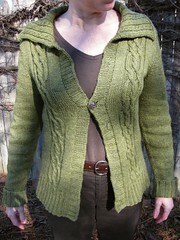 I feel pretty certain that I'll make this sweater over and over and over again. It will be just like my favorite simple sock pattern, memorized and completely thought-free, easily adaptable and easy to knit. Last, but most certainly not least, it looks really great on me, if I do say so myself. Maybe one day when there is a working digital camera in the house (or if anyone has any shots from Saturday at Rhinebeck that happen to show this sweater on me?) you'll be able to judge for yourselves. Have I mentioned that I love it? Specifically, a finished object. Whee! Even better. What: Knee high boot socks for ME. Pattern: Wendy's basic toe up sock with short row heels, found here. 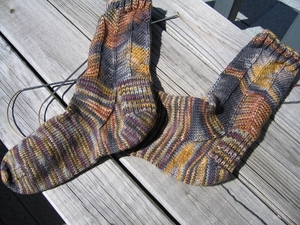 Yarn: Hill Country Yarn's Instant Gratification Self Striping Sock Yarn in colorway 'Indian Stone'. Aprox. 1 1/2 skeins made both, and I have more than enough left over for some shortling socks or a baby hat. 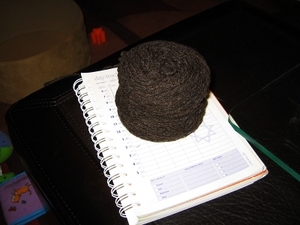 At 280 yards, one skein is more than enough for a pair of normal worsted weight socks. Needles: Two Addi circulars, size 3. 1. I am officially a member of the toe up revolution. I think this is just the bomb and satisfies my compulsive little try-it-on-every-30-seconds heart like nothing else can. Don't get me wrong, I'm not giving up on the top-down world entirely, but this will definitely be a big, big part of my sock knitting repetoire in the future. 2. I LOVE how roomy the short row toe box is for my fat little toes - yeah, yeah I know I can change the toe decreases in a top-down sock to get a similar fit, I just didn't know I wanted to until now. 3. I like the simplicity of the short row heel a LOT, and also love how it fits, but the jury's still out on how it wears. It just doesn't feel all that surdy to me, so we'll see. When next I do this kind of heel, I'll probably try to remember to add something like the SL1K1 stitch pattern to the heel knitting for, at a minimum, the padding. 4. The yarn. YUM! Squishy and soft yet also has a durable feel to it - superwash without being TOO shiny, and colors that make me giggle. Also two thumbs up. Go get some. If you like thick, scrumptious socks you won't be sorry. There are still other toe up methods/patterns to try (don't forget to read the comments if you're in the market for more really great sock patterns), but this pattern gets a huge two thumbs up at Chez Obsession. 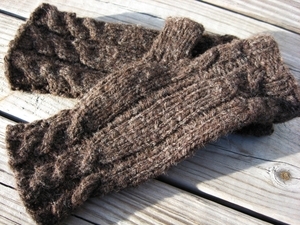 One thing I did notice, for instance, was that I missed knitting the heel flap, which - for whatever reason - I like to do. It's somehow a very satisfying part of the sock for me, and I love the looks of the swoopy little gusset lines that one gets while decreasing. Next time I do a toe up, I suspect I'll do (or at least read through) one of the several recent patterns for toe up socks with heel flaps and such. Stay tuned for further adventures in the Great Toe Up Sock Trials 2006. Tidy up. Words to live by. Baby Gator hat, being modeled for y'all this week (despite the ungodly temperatures here and elsewhere) by its most adorable recipient. Dang. Look how snug it is already. He's not going to make it all the way through the football season with this hat is he?